To Follow Your Heart Or To Follow The Brain? I must have heard the Stanford University speech a thousand times now (<- not an exaggeration). I still get goosebumps, every time I hear Steve’s soft voice hammer the point deeply into my head. So, the heart of this theory (if you will pardon the pun) is that, if you follow your heart by choosing a career/doing things you love – you will succeed in life, right? Conventional logic begs to disagree. What if your passion is in a field that is too competitive, and what if, despite the best of your efforts your efforts fail to materialize in achieving your passion? Is the career that you’re about to choose based on your passion really your passion? Once you’re midway in a field, changing lines may be close to impossible at times. You could always follow a more economically rewarding position. 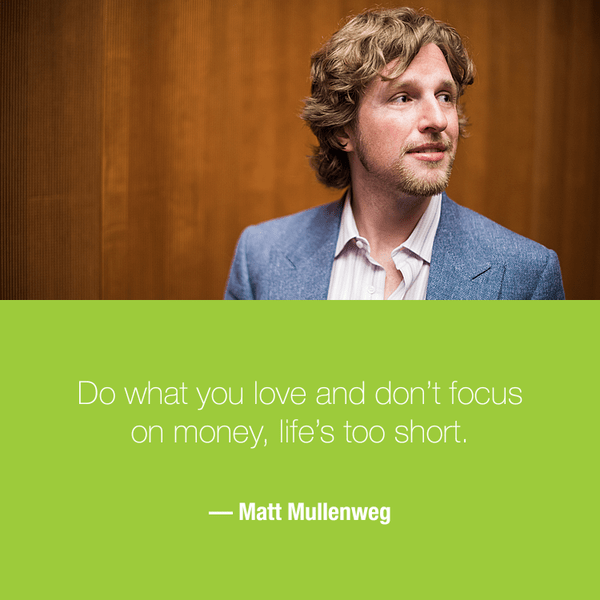 As your primary job gives you enough money, you could follow your passion in your free time. I can cite a dozen more points against the ‘following your passion’ platitude, but I stop here. Picture this: You’ve just realized that you’re exceptionally talented in a particular field. You’ve listened to a couple of motivation speakers/read a few books/were inspired by a close friend or a teacher. And you’re all set to do what you love. And that’s when someone – a skeptic (usually a parent or a close friend): asks you these gut-wrenching questions, which you fail to answer. You lose confidence. Your dreams are shelved. Boom. SHUT OUT ALL THAT MEANINGLESS LOGIC AND BLOODY DO WHAT YOUR HEART TELLS YOU TO DO!!! […]Your time is limited, so don’t waste it living someone else’s life. Don’t be trapped by dogma — which is living with the results of other people’s thinking. Don’t let the noise of others’ opinions drown out your own inner voice. And most important, have the courage to follow your heart and intuition. They somehow already know what you truly want to become. Everything else is secondary. 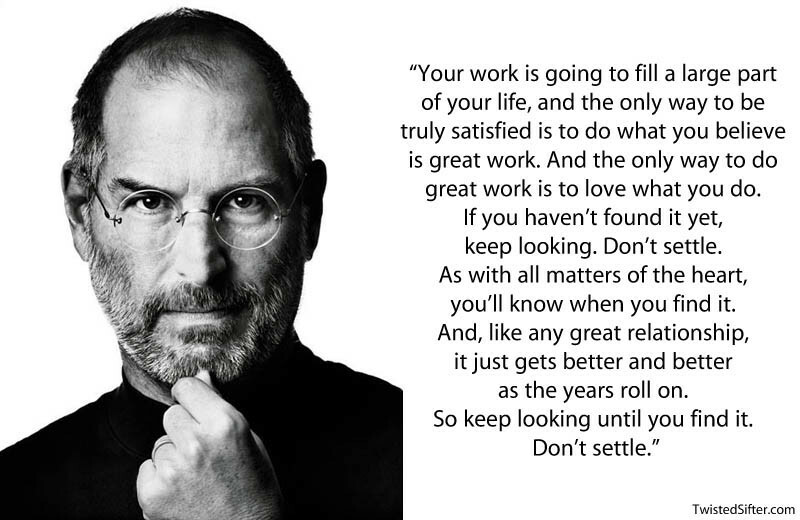 This part of the Steve Jobs’ speech sums things up for you. You have one life. If you live the rest of your life, doing things just because your grandmother or your uncle’s best friend told you that ‘this is the best way to make the most out of your life’, you should probably kill yourself right now, cause your life’s going to do it for you otherwise. It’s going to lead you to a slow and painful death – which is an entire life of disappointment and depression. Oh yes, you can always follow your heart and choose to live too. A life of happiness, and joy! As for the ‘logical questions’ – All these questions have a ‘what if’ part, that showcases the negative side of things. Okay, you’re starting out on something new and the first thing you hear is the plight of somebody who has tried and failed. The negative thought is planted in your mind, and the seeds of failure have sown themselves. Erase your mind, be positive – for every person who has failed, there is another person who has achieved spectacular success (the proverbs about failure are bloody wrong, I tell you!) Look around. Start your venture – with a positive mind and concentrated effort. Success will follow. Honestly, if you’ve put in the best of your efforts – YOU WILL SUCCEED. Nobody said it won’t be a life without hardships, though. The challenge is to stay put, cause, if your mind is well-oriented and if your efforts are prudent and in the right direction – success will be yours! As for the rare chance of ‘what-if’, life has a habit of surprising us in the most heartening of ways. In the rarest of rare case where your efforts fail to bear fruit, life will open up a new path for you. Trust me! What if I told you that liberal arts graduates earn more than their counterparts and some of the corporate majors in fact prefer liberal arts graduates? There are a lot of misconceptions about education in the society – and half baked opinions from grossly-misinformed passers-by only makes things worse for a student/job aspirant. If your passion/expertise lies in a particular field, you should go for it, no matter what! Success will follow. True, interests change as people change… but passions rarely do. You have to find what you really love to do. Something that excites you and even gives you sleepless nights, an idea that consumes you… If you choose to go for a job that merely interests you, the axiom in question holds true. But once/if you realize your passion (no matter how late it is), you can always implement it… No matter what! This is the biggest joke ever! This story will make you realize what I’m trying to say. So, to cut a long blog post short… Try to find out what you love. It’s not that hard… as life unrolls before you, it gives you plenty of hints. Ask the right questions, and you’ll find the right answers. If you have not found it yet, keep searching. The answer is just another question away. You will realize as soon as you find it. And once you find it, do not let it go – no matter what. It’s never too late. Follow your heart, no matter what.